Rafting in Nepal is an exciting way of spending adventurous holidays in Nepal. The terraced landscape of Nepal has made the water fast flowing and it creates thrilling rapids. The continuing source of water from the high Himalayan ranges in Nepal are the source of whitewater rafting in Nepal. Some of the Rivers in Nepal are deep, fast flowing and thrilling. There are various Rivers for the River rafting in Nepal. 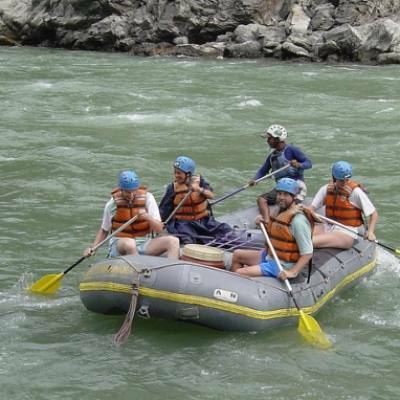 Some of the popular River rafting are Trishuli River Rafting, Bhote Koshi River Rafting, Seti River Rafting along with the Karnali River Rafting, Marshyangdi River Rafting, Tamur River Rafting and Sun Koshi River Rafting. All the River originates either the Himalayan Peaks of Nepal or the Tibetan Himalayan range. Although Nepal River rafting is an adventure program, there are various categories from gentle to the technical. The Explorer Adventure Company offers you the suitable class Rivers for your rafting packages in Nepal.